Associate Professor Dan Chambers graduated from UQ in 1993 with the William Nathaniel Robertson Medal and a University Medal. In 2002 he received an MD from the University of Birmingham, UK for his work on the pulmonary biology of nitric oxide. He completed his specialist training in thoracic and general medicine in the UK, with a particular interest in cystic fibrosis, before returning to Australia in 2003. He then returned once again to the UK to complete a Fellowship in lung transplantation at the Freeman Hospital, Newcastle-Upon-Tyne, in 2005. 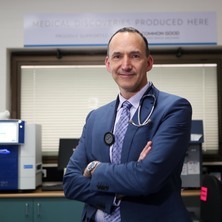 Dan was awarded FRACP in 2005 and was one of the founding clinicians of the Western Australian Lung Transplant Program where he worked until 2008. Since returning to Queensland, Dan has worked as a Thoracic Transplant Physician at Prince Charles Hospital where he is now a Pre-eminent Specialist. He is Head of Research in the Qld Lung Transplant Service and has established a vibrant independent research program within the UQ Thoracic Research Centre located at Prince Charles Hospital. His research is very translational in nature, with particular interests in cellular therapies for lung disease, ex-vivo lung perfusion and the pathogenesis of pulmonary fibrosis and chronic lung allograft dysfunction. He heads the newly established Qld Centre for Lung Cell Therapy, which is the largest facility of its type in Australia and is one of the largest and most productive in the world. Together with industry and academic collaborators, he has successfully translated promising preclinical data into first-in-man studies of cell therapies in idiopathic pulmonary fibrosis, lung transplantation, pulmonary hypertension and drug-resistant viral infection. He is an internationally recognised authority in the fields of cell therapy for lung disease and lung transplantation and is the Asia-Pacific representative on the Pulmonary Committee of the International Society for Cellular Therapy. He has attracted over $6 million to support his research program and has authored over 60 papers and book chapters. Dan was a key member of the team which pioneered ex-vivo lung perfusion to resuscitate marginal donor organs in Australia in 2011. He has used this technology to improve the safety of early phase human trials, and in so doing conceived and developed guidelines for the use of donated human lungs for research in Australia, a document now endorsed by the Transplantation Society of Australia and New Zealand and utilised around the country. In 2013 and 2014 he was a member of the International Society for Heart and Lung Transplantation Annual Scientific Meeting Programming Committee. He is Co-Chair of the Scientific Programming & Education Committee, Transplantation Society of Australia & New Zealand and was Chair of the Organising Committee for the 2015 Annual Scientific Meeting. He is a regular reviewer for all of the highest ranked journals in respiratory and transplantation medicine and is on the Editorial Board of the European Respiratory Journal. Chambers, Daniel C. and Sole, Amparo (2011). Mold infections in cardiothoracic transplantation. In Martha L. Mooney, Margaret M. Hannan, Shahid Husain and James K. Kirklin (Ed. ), Diagnosis and Management of Infectious Diseases in Cardiothoracic Transplantation and Mechanical Circulatory Support (pp. 195-209) Addison, TX, United States: International Society of Heart and Lung Transplantation. Hodge, Greg, Hodge, S., reynolds, P., Chambers, D. and Holmes, M. (2009). Leucocyte intracellular cytokines in lung transplant patients : A more physiological indicator of immunosuppression than plasma drug levels. In Charles B. Taylor (Ed. ), Immunosuppression : New research (pp. 91-115) New York, NY, United States: Nova Biomedical Books. Allsopp, T., Chandratilleke, M. G., Kermeen, F., Chambers, D. C. and Hopkins, P. (2010) Successful management of Aspergillus fuumigatus osteomyelitis in a lung transplant recipient. The Internet Journal of Pulmonary Medicine, 12 1: . Chambers, Daniel C. (2009) Adverse outcomes of labour in public and private hospitals in Australia. Medical Journal of Australia, 191 10: 578-579. Are blood cultures necessary in community-acquired pneumonia? Chambers, DC, Carpenter, DA and Ayres, JG (2001) Exchange dynamics of nitric oxide in the human nose. Journal of Applied Physiology, 91 5: 1924-1930. Sinclair, K. A., Yerkovich, S., Hopkins, P. and Chambers, D. (2016). Human Lung-Derived Mesenchymal Stromal Cells Donate Cytoplasmic Content to Bronchial Epithelium Through Microtubules, Tunnelling Nanotubes, Gap Junctions and Microvesicles. In: Cytotherapy. 22nd Annual Scientific Meeting of the International Society for Cell Therapy (ISCT) , Singapore, (S13-S13). May 2016. Sinclair, K., Yerkovich, S., Hopkins, P. and Chambers, D. (2016). Mesenchymal Stromal Cells Isolated From Pulmonary Transplant Recipients by Bronchoalveolar Lavage Are Profibrotic. In: Respirology. Thoracic Society of Australia & New Zealand and the Australian & New Zealand Society of Respiratory Science Annual Scientific Meeting, Perth, Western Australia, (91-91). 1–6 April 2016. Holmes-Liew, C., Holmes, M., Beagley, L., Hopkins, P., Chambers, D., Smith, C. and Khanna, R. (2015). Adoptive T-Cell Immunotherapy for Treatment of Ganciclovir-Resistant Cmv Disease After Lung Transplantation. In: Abstracts of the Thoracic Society of Australia & New Zealand and the Australian & New Zealand Society of Respiratory Science, Annual Scientific Meeting 2015. Thoracic Society of Australia & New Zealand and the Australian & New Zealand Society of Respiratory Science, Annual Scientific Meeting 2015, Queensland, Australia, (117-117). 27 March–1 April 2015. Ling, K., Lavendar, M., Musk, M., Wrobel, J., Garratt, L., Martinovich, K., Shaw, N., Iosifidis, T., Looi, K., Kicic-Starcevich, E., Lannigan, F., Hopkins, P., Chambers, D., Sutanto, E., Stick, S. and Kicic, A. (2015). Effects of Human Rhinovirus Infection in Large and Small Airway of Lung Transplant Recipients. In: Abstracts of the Thoracic Society of Australia & New Zealand and the Australian & New Zealand Society of Respiratory Science, Annual Scientific Meeting 2015 . Thoracic Society of Australia & New Zealand and the Australian & New Zealand Society of Respiratory Science, Annual Scientific Meeting 2015, Queensland, Australia, (142-142). 27 March–1 April 2015. Hyaluronan - the First New Biomarker of Donor Organ Quality Since Po2? Sladden, T., Samson, L., Hopkins, P., Yerkovich, S. and Chambers, D. (2015). Hyaluronan - the First New Biomarker of Donor Organ Quality Since Po2?. In: Abstracts of the Thoracic Society of Australia & New Zealand and the Australian & New Zealand Society of Respiratory Science, Annual Scientific Meeting 2015. Thoracic Society of Australia & New Zealand and the Australian & New Zealand Society of Respiratory Science, Annual Scientific Meeting 2015, Queensland, Australia, (31-31). 27 March–1 April 2015. Walsh, J., Chambers, D., Yerkovich, S., Hopkins, P. and Morris, N. (2015). Physical Activity Level - a New Marker of Frailty in Lung Transplantation. In: Abstracts of the Thoracic Society of Australia & New Zealand and the Australian & New Zealand Society of Respiratory Science, Annual Scientific Meeting 2015 . Thoracic Society of Australia & New Zealand and the Australian & New Zealand Society of Respiratory Science, Annual Scientific Meeting 2015, Queensland, Australia, (20-20). 27 March–1 April 2015. Yerkovich, S., Samson, L., Sinclair, K., Tan, M., Gallagher, H., Fiene, A., Hopkins, P. and Chambers, D. (2015). Transbronchial Brush (Tbbr) Reliably Quantifies Lymphocytic Bronchiolitis and Predicts Subsequent Chronic Lung Allograft Dysfunction. In: Abstracts of the Thoracic Society of Australia & New Zealand and the Australian & New Zealand Society of Respiratory Science, Annual Scientific Meeting 2015. Thoracic Society of Australia & New Zealand and the Australian & New Zealand Society of Respiratory Science, Annual Scientific Meeting 2015, Queensland, Australia, (19-19). 27 March–1 April 2015. Chambers, D. C., Enever, D., Ilic, N., Sparks, L., Ayres, J., Yerkovich, S. T., Khalil, D., Atkinson, K. and Hopkins, P. M. (2014). A Phase 1B Study of Mesenchymal Stromal Cell Therapy for Idiopathic Pulmonary Fibrosis. In: Cytotherapy. ISCT 2014 Annual Meeting, Paris France, (S12-S12). April 23-26 2014. Banerjee, B., Musk, M., Hopkins, P., Stick, S. M., Kicic, A. and Chambers, D. C. (2012). Direct Evidence of Chronic Epithelial Injury and Dysregulated Repair in Small and Large Airways of Lung Transplant Patients. In: Abstracts of the Thoracic Society of Australia & New Zealand and the Australian & New Zealand Society of Respiratory Science 2012 Annual Scientific Meetings. Thoracic Society of Australia & New Zealand and the Australian & New Zealand Society of Respiratory Science 2012 Annual Scientific Meetings, Canberra, ACT, (54-54). 30 March–4 April 2012. Tse, T., Hopkins, P. M. A., France, M. W., Masel, P. J., Bell, S. C., Kermeen, F. D. and Chambers, D. C. (2010). Antibiotic desensitisation in cystic fibrosis patients with a history of hypersensitivity undergoing lung transplantation is not mandatory. In: Journal of Heart and Lung Transplantation. 30th Annual Meeting and Scientific Sessions of the International-Society-for-Heart-and-Lung-Transplantation, Chicago Il, (S136-S136). Apr 21-24, 2010. Banerjee, B, Kicic, A, Musk, MM, Stick, SM and Chambers, DC (2010). Explaining the Bronchiolitis Obliterans Syndrome (BOS) Phenotype-Epithelial-Mesenchymal Transition (EMT) Occurs More Readily in Small Airway Epithelium. In: Journal of Heart and Lung Transplantation. 30th Annual Meeting and Scientific Sessions of the International-Society-for-Heart-and-Lung-Transplantation, Chicago Il, (S114-S115). Apr 21-24, 2010. Daniels, Twv, Chambers, DC, Tsang, BKT, Seale, HE, Leisbfield, TM, Kermeen, FD and Hopkins, PMA (2009). Adenovirus Is Not Associated with Graft Drysfunction Post Lung Transplantation and Does Not Warrant Anti-Viral Therapy. In: Journal of Heart and Lung Transplantation. 29th Annual Meeting and Scientific Session of the International-Society-for-Heart-and-Lung-Transplantation, Paris France, (S287-S287). Apr 22-25, 2009. Bronchiolitis Obliterans Syndrome: Do Uncultured Bacterial Species Play a Role? Alay, LA, Kicic, A, Heel, K, Banerjee, B, Musk, A, Hopkins, PMA and Chambers, DC (2009). Cells of Epithelial Lineage Are Detectable In Peripheral Blood and Are Increased in Lung Transplantation. In: Journal of Heart and Lung Transplantation. 29th Annual Meeting and Scientific Session of the International-Society-for-Heart-and-Lung-Transplantation, Paris France, (S247-S248). Apr 22-25, 2009. Mucosal Integrin Expressing CD8 Lymphocytes infiltrate Small Airways during Episodes of Acute Lung Allograft Rejection - Link between Rejection and BOS? Daniels, Twv, Tsang, BKT, Chambers, DC, Kermeen, FD, Walsh, JR and Beck, C (2009). Parainfluenza Infection after Lung Transplantation Is a Strong Predictor for Obliterative Bronchiolitis. In: Journal of Heart and Lung Transplantation. 29th Annual Meeting and Scientific Session of the International-Society-for-Heart-and-Lung-Transplantation, Paris France, (S287-S287). Apr 22-25, 2009. Lung disease in young adult survivors of moderate and severe bronchopulmonary dysplasia - A future indication for lung transplantation?